We don't know about you guys, but here at Who What Wear UK HQ we're thoroughly peeved with the current British weather. It's summer—for a few hours each day. The rest of the time, sudden downpours of torrential rain, bolts of thunder and lightning, and unexpected waves of cold are all just par for the course. It makes getting dressed each (sunny) morning a total and utter nightmare. Yesterday I returned home a drowned rat—slingback suede shoes destroyed, a soggy crew-neck participating in a private wet T-shirt competition, and a really sore arm from trying to carry a big laptop-heavy tote bag at the same time as a broken umbrella while making all-important phone calls. Because it's such a game of roulette as to whether you even need a cover-up at all, pick something really lightweight that looks just as good even if you've had to shove it into your handbag. 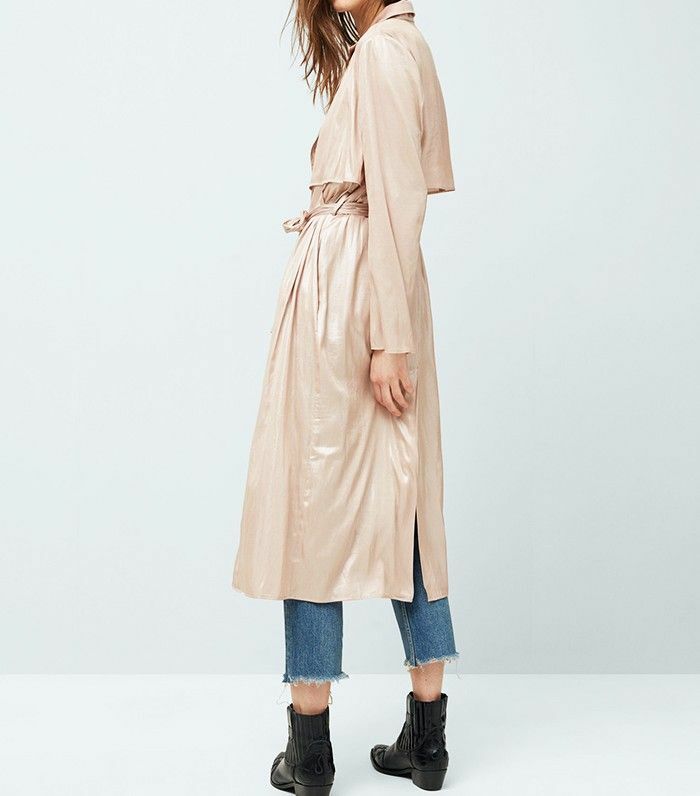 This flowing metallic trench is a great shout. I refuse to wear ankle boots at this time of the year—they just don't feel like summer. So, I'd opt for a pair of high-shine patent courts like these because a.) they repel water and b.) a chunky heel means you're less likely to go slip-sliding on your local train station's drenched tile floor. Been there, done that, got the bruise to prove it. A floaty, light-hued frock like this will make you still feel firmly set in summer, but the amount of coverage means any adverse weather can be tackled easily. Go for ankle-grazing rather than maxi as no one likes a soaked hem. Obviously you can go off-piste here and choose a cropped pair of jeans or some culottes and a top. Trying to tote your valuables at the same time as de- and re-robing—whilst carrying an umbrella, of course—is no easy feat. Make your life easy and sling this across your torso—the secure zip cover also means the content of your handbag won't get ruined. Again: Been there, done that, don't want to revisit. This is partly because a scarf is a joyful, outfit-lifting thing, but it's also practical. Knot it around your hair to keep that fresh blow-dry in tact, tie it around your neck for when the temperature dips, fasten a billowing jacket firmly at your waist, and so on. Do you have any of these pieces already? Shout out about how you're coping with the wild weather in the comments box below—and celebrate payday by shopping our top 50 summer fashion buys.